This is a review of Blackmores Nails, Hair & Skin. The manufacturer claims this product will give the consumer nails which are stronger in the time frame of twelve weeks. As a by-product, hair and skin can become more healthy, the manufacturer claims. To learn more about Blackmores Nails, Hair & Skin’s ingredients, side effects, guarantees, and if this is the right product for your condition please continue reading here. The main active ingredients in this product are biotin, silica, vitamin C, and zinc. Biotin adds strength to nails which are brittle, and decreases breaks and splits in the nails, while adding thickness to them. Silica helps support collagen formation, leading to healthier hair, skin and nails. Vitamin C serves as an antioxidant. Zinc is a mineral which is essential to healthy hair, skin and nails. Children under twelve years old and women who are pregnant or breastfeeding should not take Blackmores Nail, Hair & Skin unless prescribed by a physician. The dosage recommended by the manufacturer is two tablets a day to be taken at separate times with food, to avoid upset stomach. If taken without eating, this product can upset the stomach. No other side effects were listed on the website and after research there were no complaints found. The manufacturer states this product should not be taken while pregnant or breastfeeding, under twelve years of age, or on any medications without talking to your physician about it first. If you are allergic to any of the product’s ingredients do not take it. Signs of an allergic reaction are rash, dizziness, and vomiting. If any of these occur while taking this product discontinue use immediately and see your physician. The manufacturer sells Nails, Hair & Skin for $53.95 for a bottle of 180 tablets, which is a three month supply. There are shipping and handling charges you need to add into the total cost of this product. There is a discount offered of 30% off your first online purchase if you sign up for a membership which appears to be free. The manufacturer offers a refund, less shipping and handling charges if not satisfied with this product. 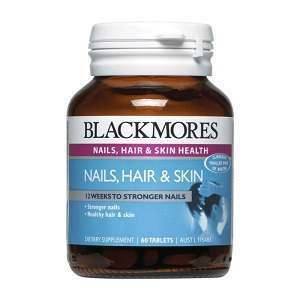 Blackmores Nails, Hair & Skin is primarily made to restore health to the nails. No re-growth of hair is claimed by the manufacturer. The ingredients in this product can help with overall health of the body and hair. Biotin and Equisetum Arvense (Horsetail) are two ingredients which are common in other products which claim to re-grow hair. There is a 100% satisfaction guarantee or your money back. The price is on the high side of most hair regrowth products. Because no reviews were found even after extensive research, this may not be the best hair regrowth product available for your needs. John Brownstone	reviewed Blackmores Nails, Hair & Skin	on August 3rd	 and gave it a rating of 3.